PHOTO BY JILL GOSCHE Jacob Bowers (left) and Robb Mack stand on the porch of Hoffman-Gottfried-Mack Funeral Home & Crematory Friday afternoon. A man who assisted with tasks such as yard work and cleaning cars at a funeral home as a teenager has returned as a funeral director and embalmer. 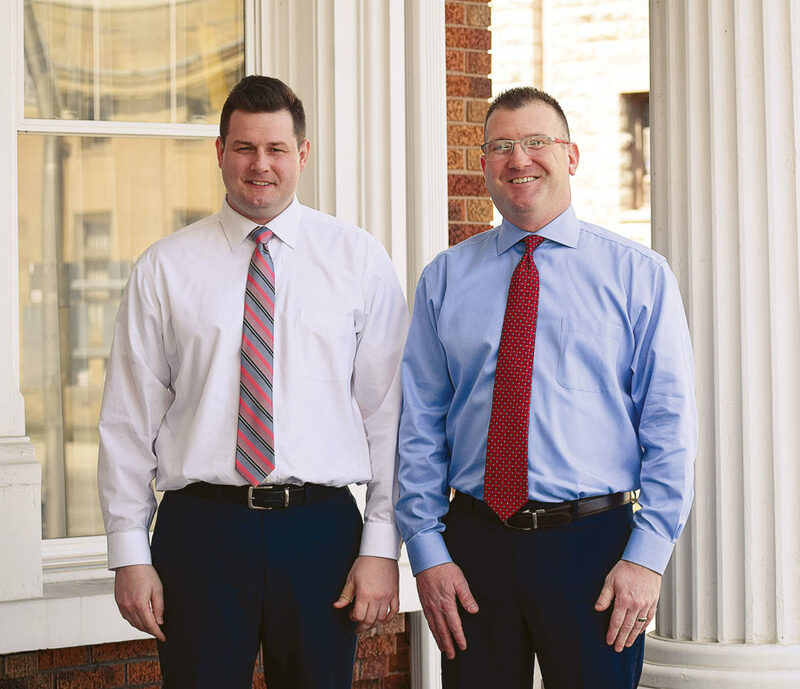 Jacob Bowers, who graduated from Calvert High School in 2010, is working alongside Robb Mack, owner of Hoffman-Gottfried-Mack Funeral Home & Crematory. He started working at Hoffman-Gottfried-Mack, 236 S. Washington St., in October. He said he was stunned when Mack contacted him. “I was excited but nervous at the same time,” he said. Bowers said he wants to learn more and wants to have Mack teach him what he learned. It has been a good choice to come back, he said. Bowers had started working at the funeral home when he was 14 years old. “He stopped in to see if I needed any help,” Mack recalled. Mack said everything he asked Bowers to do, he did, and he did it well. “He still wants to learn,” he said. Mack described Bowers as motivated and dedicated and said his embalming and cosmetic skills are great. “He’s handling things very well. … (He) works from the heart,” he said. Bowers obtained an associate’s degree of applied science from Terra State Community College and a bachelor’s degree in mortuary science from Cincinnati College of Mortuary Science. He had been working in Virginia after college graduation. Bowers said most of his close relatives work with Hoffman-Gottfried-Mack for funerals, and a previous owner assisted with the funeral for his mother, who died in an accident when Bowers was a toddler. Bowers said every family is different, and all families have their unique things they like to do. A funeral director learns about someone’s loved ones, he said. “My family’s always a caring family,” he said.